In a project that began about a dozen years ago, University of Nebraska-Lincoln scientists discovered a gene that has been used to create broadleaf crops that tolerate spraying with the popular herbicide dicamba. Now, even as an industry partner is working to bring dicamba-resistant crops to market, these plant scientists are continuing to explore new and expanded uses for the technology they discovered. 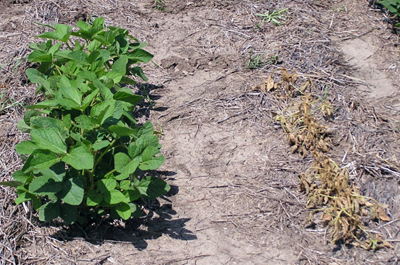 The availability of dicamba-resistant crops means that farmers soon will have more options for controlling weeds in broadleaf crops such as soybeans, canola, cotton, tobacco and vegetables. The UNL team, headed by biochemist Don Weeks, outlined its discoveries on the molecular, cellular and biochemical processes involved in creating dicamba-resistant crops in the May 25 issue of Science, the international weekly journal. Dicamba-based herbicides, sold under trade names such as Banvil and Clarity, are relatively inexpensive and easy on the environment because the chemical disappears quickly in plants and soil. But like all broadleaf herbicides, dicamba kills broadleaf crops as well as their weedy cousins so its use presently is limited to corn and other grassy crops. The UNL team identified soil bacteria that break down dicamba and isolated the gene responsible for imparting resistance. Plant Scientist Tom Clemente, head of the university's Plant Transformation Core Facility, helped the team insert this gene into a plant's chromosomes, successfully transferring dicamba resistance to the plant. They also discovered that they could modify the gene to target the DNA of the plant chloroplast, where photosynthesis occurs. This approach has significant practical implications. Since chloroplast genes are inherited through the maternal side, not through male pollen, it eliminates the chance that resistance could inadvertently spread to other plants through pollen. The team's genetic modification technique worked in both lab and field trials. For example, soybeans carrying the dicamba-resistant gene were unharmed by dicamba sprayed at a rate of 2.5 pounds per acre, about 10 times the normal application rate. "There are a number of levels at which we think this technology will be useful," Weeks said. "It will certainly allow for excellent control for broadleaf weeds in broadleaf crops like soybeans and cotton ... Controlling broadleaf weeds in broadleaf crops has always been a challenge and often quite expensive." The new technology, Weeks added, also will help strengthen integrated weed management strategies. "Importantly, we think that this technology will help to extend the lifetime of the Roundup Ready technology," he added. Some Roundup-resistant weeds have emerged in recent years, but working dicamba products into a weed-control strategy with Roundup could help counter that trend and lead to more complete weed control. In addition, development of dicamba-resistant crops should further encourage use of conservation tillage practices that decrease soil erosion and foster more sustainable and environmentally sensitive farming, Weeks said. UNL has patented this technology. In 2005 UNL signed an exclusive licensing agreement with Monsanto Co. to develop crops tolerant to dicamba, using UNL's technology. "Monsanto is clearly moving forward with this technology, taking it through the regulatory processes at USDA, EPA and FDA, as well as conducting a number of field trials," Weeks said. Dicamba-resistant crops aren't expected to be commercially available until early in the next decade. In the meantime, Weeks said, the agreement is supporting his team's continuing dicamba-resistance research -- a key payoff of such technology-transfer agreements between universities and private industry. "We're testing for efficacy in other crops; that research is looking promising," the Institute of Agriculture and Natural Resources biochemist said. "We also have explored some other aspects of this technology and have exciting new observations that we soon hope to have patented. "Monsanto is funding the research, which is conducted through the university's Agricultural Research Division, a part of the Institute of Agriculture and Natural Resources.